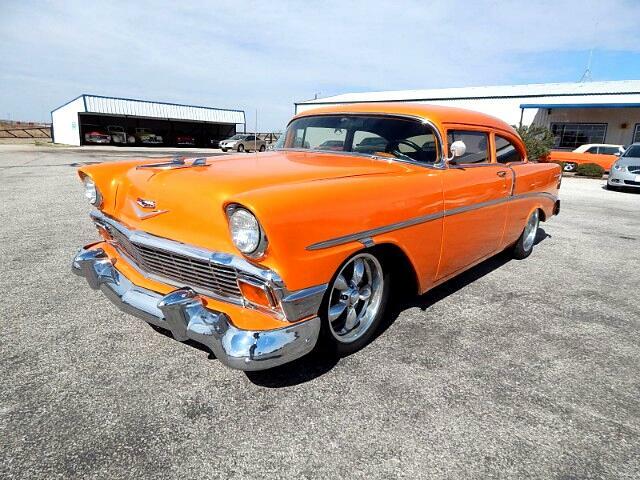 Lone Star Muscle Cars Is Proud to present this one of a kind 1956 Chevrolet Bel Air Post. Powered by The Ram Jet 502 motor that blends the legendary torque and performance of the Big-Block with a modern port fuel injection system and tunnel ram-style high-rise intake manifold. It's a combination that offers uncompromising performance - including 502 hp and 568 lb.-ft. of torque - in a visually stunning presentation. The unique Ram Jet fuel injection system stands 11 inches tall at its highest point and consists of a two-piece manifold/plenum assembly, eight injectors, a throttle body, and an updated MEFI 4 controller. Supporting the Big-Block's style and performance is a robust bottom end featuring an all-forged rotating assembly installed in a strong, latest-generation block casting with four-bolt main caps. It also has high-flow aluminum oval-port cylinder heads with 2.25/1.88-inch valves, and the engine package includes an aluminum short-style water pump and HEI distributor. Chevy Big-Block (cu in): 502 Bore x Stroke (in): 4.470 x 4.000Block : Cast-iron with 4-bolt main caps Crankshaft : Forged steel Connecting Rods : Forged steel, shot peened,Pistons : Forged aluminum Camshaft Type : Hydraulic roller Camshaft Lift (in): .527 intake / .544 exhaust Camshaft Duration (@.050 in): 224° intake / 234° exhaust Cylinder Heads : Aluminum oval port; 110cc chambers Valve Size (in): 2.250 intake / 1.880 exhaust; stainless steel Compression Ratio: 9.6:1 Rocker Arms: Stamped steel Rocker Arm Ratio: 1.7:1 Distributor HEI type Throttle Body Ignition Timing: 35° Total at 4,000 rpm Maximum Recommended rpm: 5,800 Balanced: External Under yhis Classic You Will Find A Art Morrison Chassis The front suspension provides an excellent combination of ride comfort, cornering agility and high speed stability. This is achieved with tubular steel control arms, Strange Engineering adjustable coil-over shocks and a matched rate 1" diameter sway-bar controls body roll. The OEM steering box is replaced with a superb 20:1 ratio power rack & pinion from Detroit Speed The chassis has been engineered to accommodate a 4L80E transmission. Integrated engine mounts for the BB-Chevy The rear suspension is a triangulated 4-bar with Strange Engineering adjustable coil-over shocks that provides total control of the rear end during acceleration and cornering. This design eliminates the leaf springs, allowing room to run tires up to 11.5" section width within the stock wheel wells, or if “minitubbed” tires as large as 13.5” can be fit under the car. The suspension’s performance is enhanced with the addition of a 3/4" sway-bar to minimize body roll. A Morrison chassis also lowers your Tr-Five 3-4" to improve handling and give it a contemporary stance. The chassis is specially designed with passageways in the frame crossmembers to route the exhaust system through so ground clearance is not compromised. The Morrison Tri-5 chassis is designed for optimum roll center stability under all conditions. The roll center is maintained almost perfectly thru the first 3° of body roll and beyond 3° the roll center movement is minimized resulting in a suspension that is vastly improved over a Mustang II type suspension. This provides in very consistent, stable and predictable vehicle handling. Caster has been increased to +5° (from normal +2°) to provide improved stability at speed. This also improves the tire contact patch and weight distribution under cornering. The control arm angles are designed to enhance camber control throughout the 4” of suspension travel, while minimizing side movement of tire contact patch. The side angle of the control arm contributes to increased anti-dive for better stability under hard braking, while serving to provide a smooth and supple ride. The bumpsteer curve has been designed to match camber and caster curves. The vehicle will track straight with minimal steering correction, even on bumpy pavement. Includes a front disc brake kit, SVO rear disc brake kit, Strange 31-spline S/S axles, axle bearings, axle retainers, center section mounting kit, Strange S-Series nodular-iron center section with posi-traction, U-bolts and trans crossmember. Fixture welded frame uses 2”x 4” rectangular mandrel-bent tubing with a bare metal finish. Wow We Are Just Through The Chassis And Motor. This car has only 989 Miles on Her in this one of a kind Orange Color and Custom Interior. Some Of The Creature comforts include Air Conditioning. Power Steering, Four Wheel Disc Brakes, Sound System, Chrome Tilt Wheel. Boyd Custom Wheels. This Classic Is Dripping Attitude and Slap me in the face Power. Call For More info. Visit Lone Star Muscle Cars online at lonestarmusclecars.us to see more pictures of this vehicle or call us at 940-691-1070 today to schedule your test drive. Message: Thought you might be interested in this 1956 Chevrolet Bel Air. Lone Star Muscle Cars invites all customers to view our classic cars in person. These are classic and specialty cars and trucks, therefore we offer no written warranty. We invite you to send in your independent inspector or mechanic prior to the completion of your purchase.